Our customer come back to us for our selection of hair pins, U pins, bobby pins and other hair attachment needs. We sell pins that are useful for putting hair into buns/updos, for wig styling, and for just putting your hair up/back under your wig. 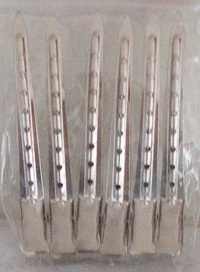 Hair pins (also called u pins) that you can use for styling buns, braids or formal up-dos/hairstyles. Or, use to pin your hair to itself when you're smooshing it down before you put your wig cap on. Our black hair pins match black, and dark brown hair very nicely. Bronze u pins match medium to light brown / dark blonde hair. Our very popular silver hair pins match silver, salt and pepper and white hair. Bobby pins are really nice for pinning back the 'whispies' that may pop up from an updo, french braid or other bun / pulled-back hairstyle. 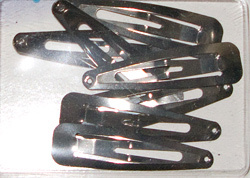 Use these 3 inch long clips to hold hair and wig fiber away from where you'll be working. 6 per bag. I never knew these had an official name, they're 'Snap easy clips' and I used to paint them tons of different colors with nail polish. Make your own matching barrettes!